Nathanael Greene (SSB(N)-636) was laid down 21 May 1962 at the Portsmouth, N.H., Naval Shipyard; launched 12 May 1964; sponsored by Mrs. Neander W. Wade, a descendent of General Nathanael Greene; and commissioned 19 December 1964, Comdr. Robert E. Crispin and Comdr. William 1\11. Cossaboom in respective command of Blue and Gold crews. Nathanael Greene departed Portsmouth for shakedown, 30 December 1964, with Gold crew embarked. They were relieved 1 February 1965 by Blue Crew. 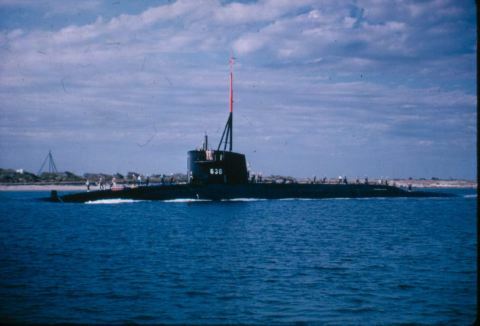 Her shakedown period was followed by availability at Portsmouth, after which the submarine, with Blue Crew embarked, departed Portsmouth for a missile loadout and her initial Polaris deterrent patrol. Rotating her crews at regular intervals, Nathanael Greene has, since that time, conducted deterrent patrols as a unit of the Atlantic Fleet assigned to SubRon 18.